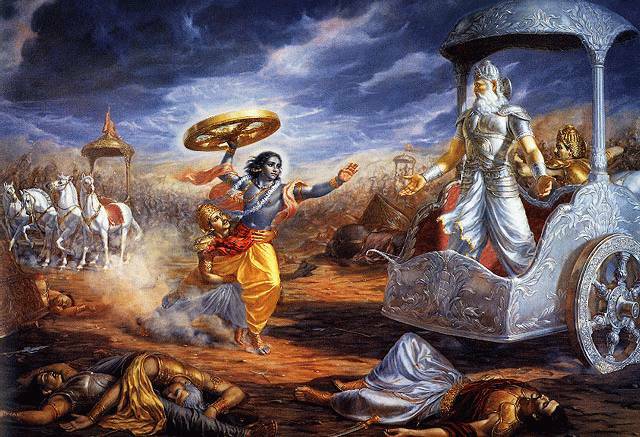 Mahabharata Podcast: News Update: Next episode is currently under construction! News Update: Next episode is currently under construction! I've finally managed to read through the entire Anusasana Parva, and I've started working on the next episode. This took some serious reading, since the Anusasana Parva is almost exactly as long as the Book of the Forest, which I covered in 22 episodes! For better or worse, Bhisma's teachings are not nearly as engaging as the Book of the Forest, so it won't take anything like that many episodes to cover. There are a handful of interesting parables, plus some additional information about a couple of our characters-- Krishna and Vyasa. Mostly, the book is full of wordy dialogues-- it is like a heavily watered-down version of the Bhagavad Gita. At the end, we are treated to all 1,000 of Vishnu's names (and a discussion of each), a list of holidays for worshipping Krishna, and some prayers and songs to Krishna. So now I'm back to work on producing episodes. Hopefully I'll have one available for you next week! Thanks again for doing all the hard work for us! I discovered your podcast today whilst searching on iTunes for Mahabharata/Ramayana related stuff on iBooks and iTunes U.
Lawrence - I was out of country for work + Vacation so couldn't read few podcast at that time, the moment I was back gone through all 4 -5 of them was specially with the treatment you gave to Karna at the end, otherwise the kind of words used for Karna in remaining episodes made me a bit uncomfortable as in Indian culture after all short comings of Karna he is regarded highly and people name their childern after Karan/karna more then Arjun. Apart from that i really liked and was very impressed by your points n comments on Dharma as a force of nature and the great churn, looking for that book on Amazon which you mentioned in that podcast. Looking forward for more of the story n your observations. Waiting for new episodes to come. I'm sorry you don't like the handling of Karna, but I swear that I said nothing worse than what is actually in the text. I know that the character of Karna is the most controversial in the epic, and a lot of people have opinions about him that are not supported by the text. I don't mean to tell them they are wrong, but all I have to go by is the text itself, and at time its judgement is extremely harsh on him. I was especially careful with Karna not to extrapolate on what is actually in the text. If I ever speculate on anything, I try to make that clear by saying it is my speculation, or I'll preface it with "presumably...". I think what makes it difficult is that the text itself is often ambivalent about Karna. But isn't that what we love about this story?!? Thanks for your interest, and for keeping in touch!